Thanks to Jim Roberts and the American Veterans Center1, warriors from current and past wars are not forgotten. The Center’s Annual Conference showcased a collection of our nation’s heroes from World War II to the most recent conflicts in Iraq and Afghanistan. They are the stuff of which legends are made. While the title legend is often attributed to such men it is seldom defined. Those who earn this title are considered “larger than life” yet the reason why is left largely unexplained. The great Catholic thinker Prof. Plinio Corrêa de Oliveira explains why. According to him, man is at birth like an incomplete sketch which is to be finished following a certain ideal model. That ideal representation is each person’s goal. It is his legend, the aspect of God which he is called to reflect. Just as each painting is unique so is each person’s legend. This at least partially explains the joy we have in hearing the stories of those who will be mentioned in this article. In our dreary world where mediocrity and a universal sameness is the order of the day, these men rise above the crowd and provide us with a glimpse of what makes them unique and special. Could it be that a man’s legend allows us to see beyond what appears, as the scriptures say2, and reveals a heart that is normally reserved for God? We will let you decide. Lt. Col. James Megellas might have been the oldest warrior at the two-day conference, but you would never have known it from his clarity of mind and amazing physical stamina. “I was born 52 years after the Civil War,” he told the audience. 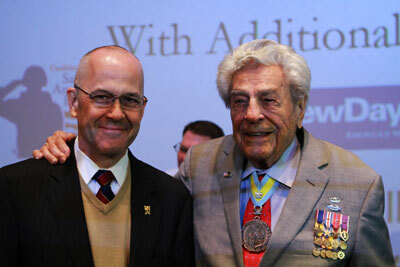 This coming March he turns 98 and held the audience spellbound with his unique combination of patriotism and audacity. 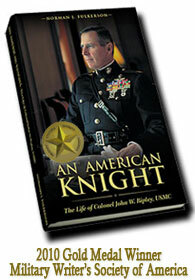 He is the most highly decorated officer in the history of the famed “All-American” 82nd Airborne Division. On January 28th, 1945 he earned what many thought should have been the Medal of Honor. After leading a platoon through miles of knee deep snow and bitter cold, his men arrived in the town of Herresbach, Belgium, tired and hungry. To his surprise, he spotted a large force of German infantry who were completely unaware of the American presence. Lt. Col. Megellas and his men were on the short end of 10-1 odds but as he told the audience, when faced with such a situation it was either “kill them or they would kill us.” Outnumbered and outgunned, he knew the Americans had one distinct advantage, the element of surprise. He took full advantage of that factor and courageously led his men in the attack. The paratroopers overran the stunned Germans in a ferocious assault that lasted little more than ten minutes. One hundred enemy combatants were killed—28 by Lt. Col. Megellas himself—and 180 captured. Not a single American life was lost. The talk given by Gen. P.X. Kelley, the 28th Commandant of the Marine Corps, was arguably the most moving. 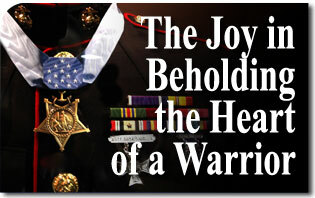 Most of it dealt with his illustrious career which took him to the highest position in the Marine Corps, but it was the anecdotes along the way that made it all so memorable. Throughout the years and most especially when he became commandant, Gen. Kelley explained how he never missed the opportunity to speak with any enlisted man who crossed his path. In a very fatherly way, he took interest in them and what was going on in their lives. This provided him not only the opportunity to see how they were doing, but more importantly showed them he cared. He then held the audience in the palm of his hand with two particularly moving stories. On one occasion he described a gut wrenching scene during the Vietnam War. A young Marine was shot in the head during a particularly intense battle. He had lost part of his skull and was bleeding profusely. It was clear to General Kelley, the medic and the young man himself, that he was not going to survive. Nevertheless, the wounded man had the presence of mind to warn, then-Colonel Kelley of the impending danger that lay ahead. “Be careful Colonel,” the dying man said, “the hill is mined.” Tears welled up in Gen. Kelley’s eyes as he put that scene into perspective. “Those were the last words that young man would ever pronounce on this earth,” he told the audience. Yet he was not concerned about his own life but rather the safety of those who would carry on the fight. Gen. Kelley then described the comfort he derived whenever visiting the Vietnam Memorial to simply place his hand on the name of that man who with his last dying breath most likely saved him from a similar fate. His trip down memory lane did not stop there. He told the story of delivering the sad news to a mother that her son had died in battle and would not be coming home. The grieving mother, with an attitude of unselfishness, took Gen. Kelley’s hand into her own, looked him square in the eye and said, “When the Lord gave me my son, he never promised how long I could keep him.” She then put her own sorrow aside and reassured Gen. Kelley. Former Navy Seal Jason Redman was part of the wounded warrior panel. In September of 2007 he was the commander of an assault force to capture an Al Qaeda High Value Target when his team came under heavy machine gun and small arms fire. He took a round which entered near his ear, exited the right side of his face, blew out his cheekbone, shattered his jaw and removed his nose. Sensing the life run out his body made him angry3. 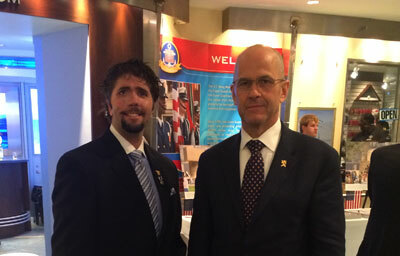 Lt. Jason Redman (left) with author, at the United States Navy Memorial in Washington DC, before the Wounded Warrior panel part of the annual Veterans Conference. He then asked God to help him live. Suddenly he sensed a newfound strength to go on and began to the think more clearly. When helicopters arrived he knew, “by the grace of God, I was going home.” As fellow SEALS helped him to the chopper Lt. Redman described a “miraculous strength” which allowed him, under his own power, to walk the final 75 yards. He survived that battle, and over 37 surgeries to repair his face, with an indomitable spirit. Visitors at Walter Reed Medical Center were shocked by the handwritten orange sign that hung outside his door. It was eventually photographed and went viral on the Internet. If you are coming into this room with sorrow or to feel sorry for my wounds, go elsewhere. The wounds I received, I got in a job I love, doing it for the people I love, supporting the freedom of the country I deeply love. I am incredibly tough and will make a full recovery. What is full? That is the absolute utmost physically my body has the ability to recover. Then I will push that 20% further through sheer mental tenacity. This room you are about to enter is a room of fun, optimism and intense rapid growth. If you are not prepared for that, GO ELSWHERE! The enemy might have broken his body but they did not touch his spirit. Lt. Redman did, however, express concern during the chopper ride back home, over how his wife would react to his horribly disfigured face. He had heard horror stories of wives who had walked away from husbands with such injuries and feared he might suffer the same rejection. So did two proto-typical Southern ladies from Decatur, Alabama who are regular attendees as such events. Mrs. Faye Hooper is widow of Medal of Honor recipient Capt. Joe Hooper, the namesake of the Joe Ronnie Hooper Award, given each year to a particular serviceman. During his tours in Vietnam, Capt. Hooper earned more medals than both Audie Murphy and Alvin York. Besides the nations highest award he tallies 37 others, including two Silver Stars, six Bronze Stars and eight Purple Hearts. Faye Hooper wife of Medal of Honor Recipient Capt. 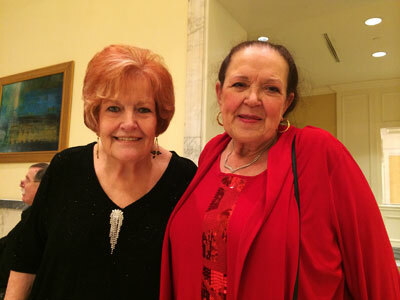 Joe Hooper (left) with her “sister soul” Joan McCollum before the Honors Award Banquet at the Mayflower Hotel in Washington DC. If there were an award for enthusiasm, his wife Faye and her good friend and “sister soul” Joan McCollum would have received truck loads during the conference. From beginning to end, these two charming ladies occupied a front row seat at every single presentation. Their smiling faces were as enjoyable to observe as the heroes themselves. They listened to each talk with perfect attentiveness as if fearful of missing a single word. One would say they did not just absorb information with their minds, they drank it in with their souls. Contrary to normal human limitations, they seemed to gain energy and a youthfulness as the conference progressed with each passing story of heroism and dedication. They, like Erica Redman were clearly able to go beyond “what appears” and took joy in seeing the heart, or more particularly the legend, of these American Warriors.